The Good Catholic Life is taking a one-day midweek break, and so we’re re-airing one of our recent popular shows. 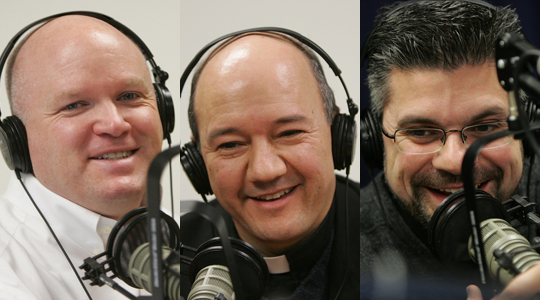 Today, we bring you an encore presentation of an interview by Scot Landry and Fr. Matt Williams of Fr. Paco Anzoategui, Pastor of St. Stephen Parish in Framingham and Director of the Spanish Apostolate. Fr. Paco talks about his journey from Mazatlan, Mexico, to the priesthood in the Archdiocese of Boston and how he credits the Blessed Mother for his vocation in a direct way. Fr. Paco also discusses Hispanic ministry in the Archdiocese and the US, including the trend of the growing Hispanic majority, plus why some Hispanics leave the Catholic Church for Evangelical churches, and how to make one parish family that includes both English- and Spanish-speaking communities. Complete show notes may be found on the original air date’s show page.